By participating in this hands-on workshop, you will learn to build a two legged robot or a biped walking robot which will have six degrees of freedom with a hip, knee & foot and mimic the walking action of humans. 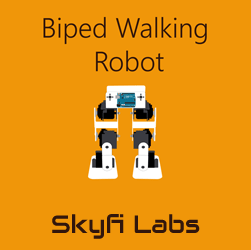 By building this biped walking robot project, you will practically learn about Arduino architecture & its programming, working of the servo motors - which acts as actuators & the programming logic behind the human's walking action. (*) These Tools are part of the Hardware Tool kit and will be taken back. Anybody interested in Mechatronics Technology, Humanoid Robotics, Arduino Programming, Industrial Robotics can attend this workshop.